No other Columbus, Ohio, roofing contractor offers you more warranty choices for your new roof than Muth & Company Roofing. Simply put, we offer the best and safest warranties in the roofing business, backed by the largest roofing materials manufacturers. 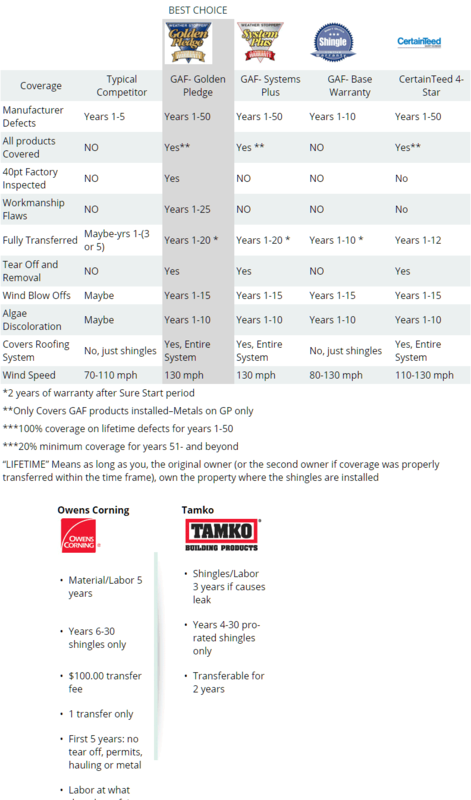 To help you select the right warranty, the chart below summarizes the key provisions of each of our roofing system warranties. Of all the roofing companies in Columbus, Ohio, and surrounding communities, the team at Muth & Company Roofing will help you decide which warranty plan is best for you. Muth & Company Roofing is the roofing contractor Columbus homeowners turn to for the best roof warranty protection! Of all the roofing companies in Columbus, Ohio, no one knows our local communities better than the team at Muth & Company. And very few contractors will show you the different warranties available, or even be certified to offer you the best warranties in the industry. That’s why when comparing roofing companies, Columbus, Ohio, property owners like the straight-talk professionals here at Muth & Company. Call us today at (614) 682-3060 for a FREE estimate on Columbus roof repair or Columbus roof replacement, or complete the form on the right side of this page.